San Diego is quite popular for its Balboa Park. The park is spread in 1200 acres and nestles the globally acclaimed Zoo and some wonderful and eminent museums. Balboa Park is also the cultural center of the city. It parades an incredible variety of flora that mesmerizes each and every visitor. The zoo in the park is a home for more than 4000 animals of various species. It is a habitat for some of the most exclusive or rare species of birds and animals on earth. Besides this the Balboa Park is swarming with people because of its fantastic museums. These museums are variously devoted to San Diego’s history, science, art, cars, railroads, mankind etc. For instance the San Diego Mueseum of Art is the largest museum of San Diego that displays the magnum opus of great artists. Picture yourself relaxing on a sandy beach while your kids run and jump in the waves. Maybe you'll decide to scoot over to Mexico for lunch, visit with the Panda bears, or spend the afternoon riding a scenic trolley. Can't decide which of these vacation activities sound most appealing? Experience it all with a San Diego vacation. San Diego beaches are spectacular year-round. 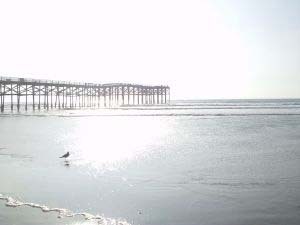 Whether you visit in summer or over the winter holidays, the local beaches personify the complete San Diego lifestyle. Visit gorgeous Mission Beach. Ride the Belmont Park roller coaster. From bodysurfing to soaking up the rays, San Diego beaches are definitely where the action is. San Diego is one of the top vacation destinations in the country. If you are planning a trip to our city, here are some things you should consider doing while here. Beaches. Obviously, most people come to San Diego to sit on the beaches. Well, you will not be disappointed. You have a lot of choices as there are all types of beaches for different sets of people, mostly age related. If you are looking for people in their twenties and a party atmosphere, Pacific and Mission beaches are the place to be. We are talking about a beach packed with kids, volleyball, surfing and a boardwalk full of people talking and just people watching.